(Newser) – They couldn't figure out the blue. 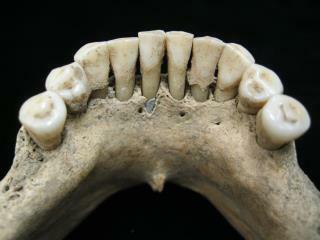 Scientists studying tartar from the teeth of medieval skeletons hoped to learn a thing or two of about diets of the Middle Ages. But when they put the teeth and jaw of one woman under a microscope, they were surprised to see hundreds of tiny flecks of blue, reports the BBC. After much sleuthing, they figured out that the blue came from lapis lazuli, a rare and expensive stone ground into powder to make dye for sacred manuscripts. Typically, male monks have gotten most of the credit for working on such texts, but the amount of lapis lazuli in the woman's mouth suggests that she—and presumably other women—were also on the job. Researchers' best guess is that the blue flecks ended up in her teeth because she kept putting the tip of her brush in her mouth, reports the AP. These comments just prove how far superior many men are not. They were servants. Women have never been creators. Except in fiction.